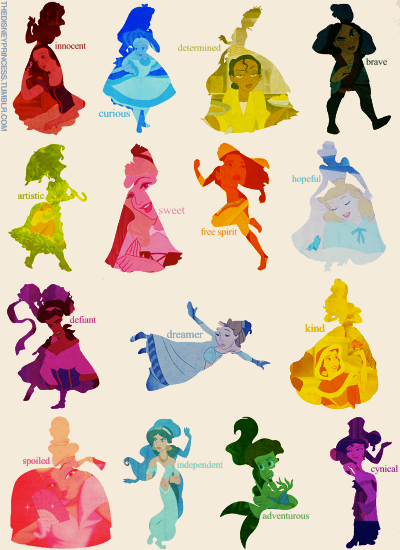 Some-one out there has created pictures centring solely on the negative aspects of each princess’ tale. If you read them, you’ll see that most are taken way out of context and none take into account the personality of each character. The image above on the other hand, displays some very strong and encouraging traits (the exception being spoiled). Some of them (such as brave, artistic, defiant, independent, adventurous) are certainly traits that I would expect any female to have. The important contrast between the opposing images is that one side heavily reinforces a point of view that completely removes the story and setting from the equation. The other focuses strictly on the personality trait that best describes the character. I know I may be comparing apples to oranges (in fact, I probably am) but I would much rather consider the characters in the positive light. How about you?